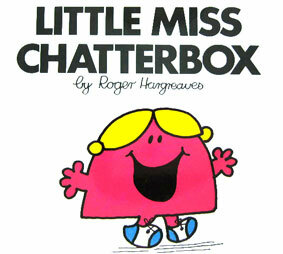 It probably comes as little surprise that my favorite “Little Miss” book was “Little Miss Chatterbox” as a kid. I grew up being called “Mouth” and have a tendency to speak before thinking. As a result, all too often, I’ve put my foot (or left leg) in my mouth. As you can imagine, I’ve found solace in the blogging community — where I have had free reign to say whatever comes to mind (for the most part). One could argue blogging is a self-indulgent activity: putting your thoughts and feelings out there for the world to see. But the truth is, I didn’t begin blogging to cultivate an audience. Rather, in the beginning, I used blogotherapy as a personal outlet — a one-way street (which, I should note, goes against absolutely everything I know today about how successful social media strategies work). In time, it morphed into much, much more and became very much a two-way street. Sure there were road-blocks and sometimes it felt more like I was looping endlessly around a cul-de-sac or careening down a four-lane highway at other points … but today my blog is a living, breathing entity and I’m really, really proud of how it has matured since June 2008 when I began blogging. I love the friends I’ve made offline as a result — and appreciate the friendships in real life that have been strengthened by my “coming out” of sorts. (I’m always surprised to find out who is reading! Even if you’re just lurking, your emails and calls have meant the world to me). And as I’ve journeyed through my recovery, I’ve experienced more self-awareness than I could ever have imagined. You see, as a first-born who often gives off the vibe that the world should revolve around me, my dad has often teasingly/ lovingly dubbed me “Copernicus”. I laugh about it most of the time, but there is always some truth to a joke. I do tend to be one of those people where what you see is what you get (WYSIWYG, that’s for you S.A.!) and the truth is, I enjoy talking about myself — not because I think I’m so great or anything, but because that’s simply how I relate to people — it’s my way; through sharing my own experiences and relating it to yours, we connect (or so I think). It’s annoying to some people, I’m sure, that I often find a way to turn the conversation back to myself … but maybe others admire that this is how I connect with people. Who knows. Either way, through my self-awareness journey over the past two years, I’ve recognized that it’s who I am and I have come to accept that not everyone will like that about me — and that’s perfectly OK. Yet I think there’s a big distinction between being self-aware and being narcissistic. Self-awareness isn’t inherently bad; it usually helps make us better people, as we see our flaws and work to improve them. But narcissism is unbecoming .. and sometimes I fear I’m crossing the lines when I blog … After all, where else do you have a platform and a proverbial megaphone? Throughout this self-awareness journey, one of the things I’ve realized — which has very little to do with disordered eating recovery but everything to do with having an anxious personality — is that I always have to get in the last word. If someone calls me, I’m usually the one to say goodbye last. If you email me, chances are I’ll write back last. If you tweet me, I’ll tweet you back. I try to be cognizant of external cues, but often, it’s an epic fail. Everyone else seems to know where to cut the communication off, where to stop … everyone but me. This might seem like a minor offense to some people — but I am realizing it is pretty annoying, and would love some advice on how to overcome this. A significant chunk of my professional life revolves around communication, and being a good communicator is crucial. While I recognize it’s part of who I am, I don’t want to piss people off if I can avoid it, either. So I’m reaching out today. I welcome your input, blogosphere. Please, be honest … hold nothing back. I wouldn’t ask if I didn’t think I had the stomach to handle the (constructive) criticism. Thank you in advance; I’m really curious as to your thoughts. I think that’s just it, Amelia — it IS about anxiety … I never want someone to think I’m avoiding/ignoring them; that’s not my style. But then the flip-side is, it can become an incessant battle to stay “ahead” of the game and sometimes it falters. Oh wow, that is a really interesting perspective … A REALLY interesting perspective … maybe you’re on to something there? Though this behavior has existed from forever for me … but maybe the fact that I’m aware of it means something. I have the same problem and I think that Amelia really hit the nail on the head as to why I do it. But I also feel the same sense of anxiety if the other person just stops responding, too. I understand what you’re saying. I’m a first-born too, and I definitely find comfort in relating to people through sharing my own opinions and experiences. I often wonder when/if I cross the line to self- obsession. I don’t necessarily think having the last word is annoying, however I do think it is more due to our anxiety than some selfish need. We want to look back at conversations and remember them as perfect, from start to finish. I feel like if I have that “perfect ender”, then it will not end awkwardly…etc. But that’s not how it works. I guess I’m working on giving the other person the lead, and it’s easy as long as you remain conscious of your efforts while still being engaged in conversation. “I guess I’m working on giving the other person the lead, and it’s easy as long as you remain conscious of your efforts while still being engaged in conversation.” — awesome advice, Jenn…I need to keep this in mind. I related to this post very much. I always feel like I need to get the last word and often wonder why. I am first born as well and often find myself telling people things about myself when really, I am just trying to feel relate-able. I offer advice by sharing how I went through something similar and I know I have crossed the line. I’ve peeved people off when all I wanted to do was make them feel like i understood and that I was on their side. Thanks, Christie. Exactly, we want to be relatable … but it can come off wrong to some people. It’s a shame, but we’re all wired differently. This is so interesting. I can definitely relate to needing the last word in an argument. DEFINITELY. I’ve had some instances lately (won’t go into detail here!) with extended family that got ugly, and it pissed me off beyond belief when I thought it was all said and done (I had had the last word), and then they sent flowers to me. My husband couldn’t understand why I was so miffed, and I couldn’t really explain it, either…but now the lightbulb has gone on and I realize it’s because I didn’t get the last word! However, I have never thought of needing the last word in just everyday, non-confrontational exchanges. I would say in those instances, I don’t really notice or care. I wonder why that is…. Lara, your last comment seriously MADE my day; thank you!!!!! I can TOTALLY relate to your story, too. I would’ve felt the same. ugh, i admit, i am a last word person too, even with my kids. how pathetic is that? I actually loathe talking about myself outside of a virtual context. But that doesn’t mean I don’t enjoy the realm of the “last word.” A counter-productive competitive streak (although some streaks can be quite productive), an inability to detach from the supposed issues at stake and a misplaced desire to be accepted by being acknowledged as right are all reasons why I seem to relish this realm. But every once in a rare while, I’ve just got something to say. Good point, Mom! 🙂 Pretty sure you hit the nail on the head about being a first-born, etc. I have noticed the “getting the last word in” thing in your blog through the comments, but thought that maybe it was intentional. Some people who blog want to make an effort to answer every comment received, out of courtesy or showing interest. On other blogs the original poster tends to just answer one or two comments or none at all. I tend to ask the following when attending an event or meeting up with friends: am I having the attitude of “here I am, pay attention to me!” or is it more “there you are! How are you”? I try to respond out of courtesy/interest/to engage with my readers, as it’s my blog/my platform to do so. But I don’t always answer every comment, though I absolutely read them all and appreciate them.